I know the Dodger fans who read this blog are wondering, "well, how about us True Blue fans?" And, yes, we Dodger fans are a passionate group, but as many of you know the fanaticism of your run-of-the-mill Kings hockey fan is something entirely different. After all, when you choose to be a Kings fans in an area filled with so many other options you can't help but wear your pride on your sleeve. Add the fact that we are a long suffering bunch only amplifies the passion. So, tonight we will arrive in downtown LA for the first home game in a first round match up against the San Jose Sharks. Yes, the rivalry between north and south even extends to hockey. It will be a loud and raucous affair filled with black laden fans (fans are being encouraged to wear black- a veritable "Black Out"), a live band (The Briggs will be performing their song "This is LA"), and a local team that has so far controlled most of the action on the ice this series. For more, check out the always excellent Kings official blog- LA Kings Insider. Also check out Mayor's Manor- who has quickly become one of my favorite Kings blogs. WooHoo! Playoffs, Baby! It's is here! For your enjoyment, below are some great Kings videos. Time to get pumped up! This is from last year, but it's so damn good. 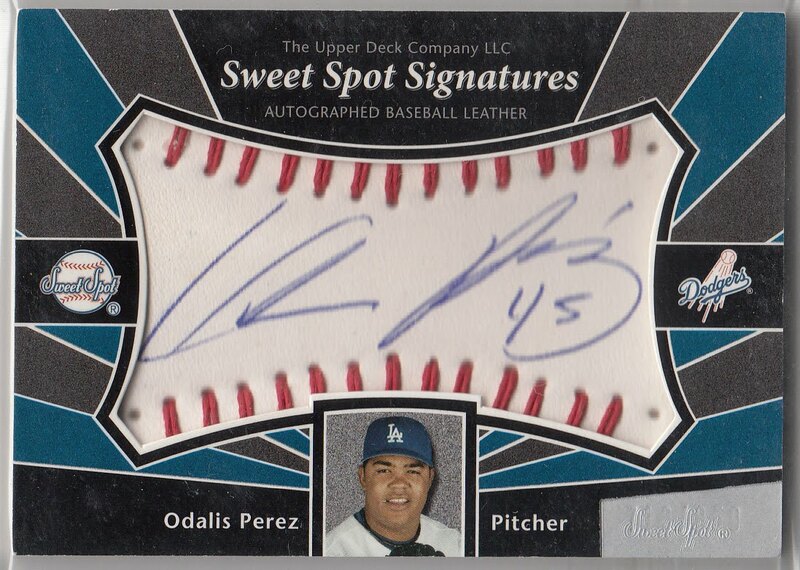 Ya know, I always liked Odalis Perez. He started with a bang for the team in 2002 as he recorded 15 wins with a 3.00 ERA. Even more impressive was a strike out to walk ratio of over 4. That's 4 strike outs for every walk he gave up. Unfortunately, in his following years he struggled with keeping runs off the board, but still maintained a healthy K/BB ratio of nearly 3. 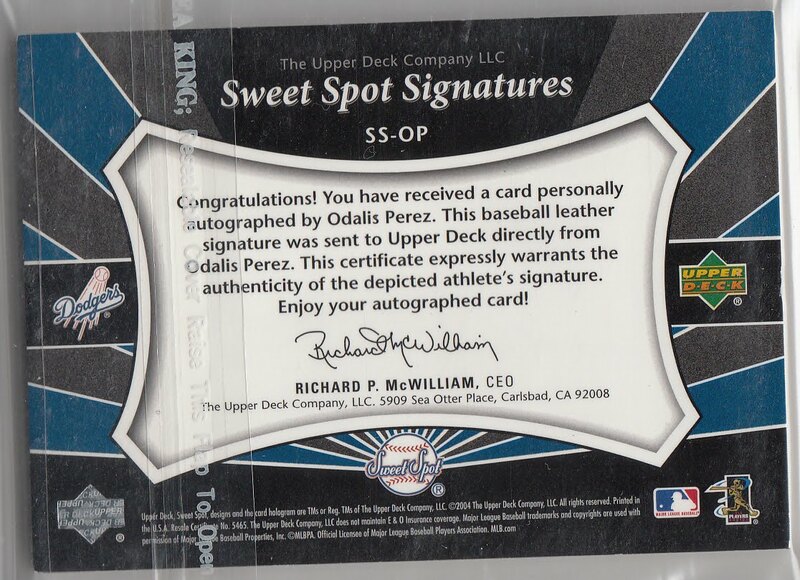 Nevertheless, by 2006 he was shipped off to Kansas City for Elmer Dessens, and disappeared from the league just a couple of years later. His one claim to fame is being the first pitcher to give up a home run in Nationals Park to Chipper Jones. Here is another Sweet Spot Signatures card of Odalis Perez from 2004 from my collection. Jackie Robinson Foundation Award- "The ROBIE"
SCP Auctions, now famous for its sale of some Kirk Gibson memorabilia, is now running their most recent auction that focuses on items from the estate of former Boston Celtics coach and President, Red Auerbach. As expected, most of the items available are basketball related, but there is one item that struck the fancy of this Dodger fan. "...outstanding record as a successful business leader, positive role model and pioneer in your efforts to open up professional basketball." I'll let the auction description describe the award itself. The Jackie Robinson Foundation (JRF) is a national, not–for–profit, organization founded in 1973 as a vehicle to perpetuate the memory of Jackie Robinson through the advancement of higher education among underserved populations. The Jackie Robinson Foundation Awards Dinner is held annually at New York's Waldorf-Astoria Hotel. 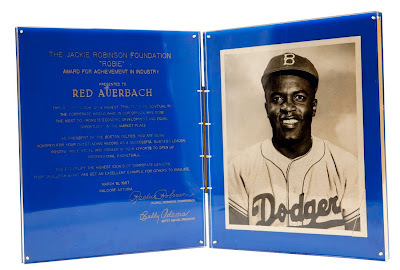 For nearly three decades, the iconic event pays tribute to individuals who embody the humanitarian ideals of Jackie Robinson and raises funds for the Jackie Robinson Foundation. Go to their website here to learn more about this organization. Punk Rock Paint continues with his Star Wars Retro Baseball Card set. Below is card #8- C3PO on a 1888 N162 Goodwin Champions design. Check out this label to see his other Star Wars creations. Cooperstown Chatter tells of a afternoon Baseball game in 1886 where a dog helped a batter with a home run. Wolf lofted a fly ball in Powell’s direction, but before he could collect the ball to return to the infield, he was attacked by a dog that heretofore had been snoozing in the outfield grass. Bob Lemke reads through an entire run of The Sporting News magazines from 1953 so you don't have to. 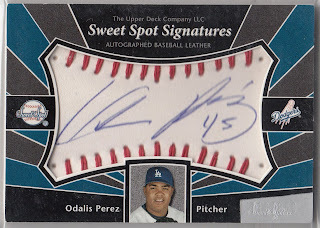 Read his post as he recounts the happenings, going-ons and his perception of what the Baseball season was like back then. The now-defunct tradition of baseball players picking up a little post-season income by scheduling barnstorming exhibition games in small towns and cities around the country was in its heyday in 1953. Besides Lopat's tour in Japan, exhibition schedules were set by all-star aggregations led by Frank Shea in New England, Jackie Robinson throughout the South and into Mexico, and Roy Campanella out west and in Hawaii. Check out the fireworks from Jackie Robinson Night this past Friday at Dodger Stadium. I sure do love the music they played.